"On crossing this threshold, we pass into a charmed territory where everything shall be in harmony." (Mackay Hugh Baillie Scott.) And that summarises Blackwell very nicely. Designed by M H Baillie Scott (1865-1945) and built between 1898 and 1900, Blackwell is one of Britain's most important examples of Arts and Crafts architecture. Sir Edward Holt, a wealthy Manchester brewery owner, had it built as a holiday home - and a spectacular one at that, with stunning views across Windermere to the Coniston fells. Blackwell is a large house, but with its half-landings and split-level spaces its architect created a house with the atmosphere of an intimate family home. It is furnished simply but beautifully, in harmony with Baillie Scott's own furnishing ideas. Nature's flowing lines, which inspired Art Noveau, can be seen throughout the house, from the design of the stained glass plants and flowers to the rhythmic scrolling foliage in the wooden panelling in the Hall. 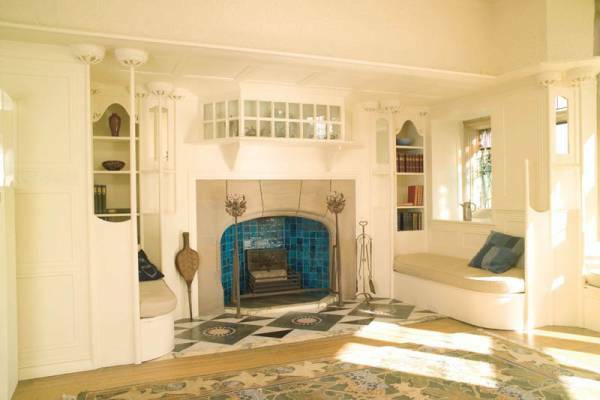 Visitors are encouraged to sit and soak up the tranquil atmosphere in Blackwell's fireplace inglenooks, which boast fine examples of tiles by the renowned Arts and Crafts designer William de Morgan. Visitors are free to enjoy the house as it was originally intended, without roped-off areas, and the inviting window seats offer stunning views of the surrounding Lakeland scenery. Blackwell has survived in a truly remarkable state of preservation and retains almost all of its original decorative features, including the rare and fragile hessian wall-hangings in the Dining Room. One of the real joys of Blackwell lies in its wealth of detail, from the leaf-shaped door handles and curious window catches to spectacular plasterwork, stained glass and carved wooden panelling. Since its restoration in 2001 Blackwell's period rooms have been carefully furnished with the blend of Arts and Crafts furniture and early country-made pieces favoured by Baillie Scott, bringing the spaces to life once more. The Arts and Crafts Movement was a reaction against the increasing dominance of mechanisation brought about by the Industrial Revolution. John Ruskin and William Morris, the ‘fathers' of the movement, championed the qualities of honest, hand-made objects and sought to re-establish the importance and worth of designer-craftsmen. Britain's consumers were urged to achieve beauty, simplicity and practicality in the home. Blackwell's period rooms contain furniture and objects by many of the leading Arts & Crafts designers. You will find furniture by Morris & Co., C F A Voysey and Ernest Gimson, metalwork by W A S Benson and ceramics by Pilkingtons, Maw & Co. and Ruskin Pottery. 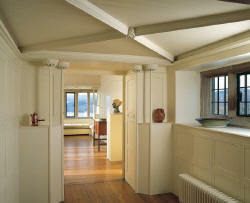 Blackwell offers more than most historic houses; several of its first-floor rooms have been adapted for use as galleries, and exhibitions are held throughout the year. Serves a range of delicious homemade food and drinks, including specialities, homemade lemonade and Blackwell chocolate brownies. Opens daily at 10.00am; entrance is free to the Tearoom. Visitors who have purchased an entry badge to the house can lunch outside or take tea on the terraces and enjoy the stunning views of the lake and mountains, far removed from the hustle and bustle of modern day life. There is a wide selection of specialist books on architecture, the applied arts and crafts. The gardens have been designed in a series of terraces to get the best views. Blackwell is bordered by beautiful flower beds set against a terrace of York stone paving, which provides one of the loveliest outdoor places anywhere in England to enjoy morning coffee, lunch or afternoon tea. The herbaceous terrace on the second level provides yet more shelter for tables and chairs, surrounded by fragrant flowers and exotic herbs. On the final terrace, climbing flowers are trained against the retaining wall and there is a long sweep of lawn (originally designed as tennis courts) where visitors can stroll and take in the intoxicating beauty of the Lake District. This Lancashire pottery produced ceramics internationally recognized for their quality and beauty, and which were sold through leading retailers such as Liberty of London and Tiffany of New York. The display, consisting of over 40 items, looks at the company's delicate lustre ware; the decoration of each piece was individually designed and carried out by a small team of exceptional artists. Original material from the Chambers Archive at Lancaster University's Peter Scott Gallery will be displayed alongside ceramics from Towneley Hall Art Gallery & Museum's extensive Pilkington's collection. This exhibition demonstrates the exceptionally important patronage of Queen Victoria and Prince Albert at an early stage in the history of photography by highlighting two key photographers: Julia Margaret Cameron (1815-79) and Roger Fenton (1819-63). The photographs by Roger Fenton in the Royal Collection rank as one of the world's finest holdings of Fenton's work. The small group of images by Julia Margaret Cameron is in outstanding condition and relatively unknown. Twenty-two of the finest works by Fenton and Cameron from the Royal Photograph Collection will travel to three UK venues. This exhibition at Blackwell, its English premiere, is complemented by a small display of photographs and photographic objects relating to the development of photography in the Lake District drawn from private collections and from the Lakeland Arts Trust's own collections. This two-part photographic exhibition by Graham Murrell is being mounted in celebration of Blackwell's ten-year anniversary. Murrell is a distinguished photographer who has both exhibited and published widely. He has an unerring eye for and skill in capturing the transient, the often unobserved angle or juxtaposition, the fleeting shades of day; in short, the spirit of a place. Two of his recent projects include Light Spells at Kettle's Yard in Cambridge and In the Landscape at New Art Centre & Sculpture Park, Roche Court in Wiltshire. Blackwell, a house full of light and shadows, textures and detail, lends itself particularly well to Murrell's benign observation. The exhibition will show Blackwell in a new, intimate and hopefully unexpected light, inviting the visitor to look with more careful eyes at a house that some will already feel they know well, whilst for others it will be an invitation to discover the ‘secret' life of Blackwell. Part two of this photographic exhibition by Graham Murrell celebrating Blackwell's ten-year anniversary. Murrell is a distinguished photographer who has both exhibited and published widely. He has an unerring eye for and skill in capturing the transient, the often unobserved angle or juxtaposition, the fleeting shades of day; in short, the spirit of a place. Two of his recent projects include Light Spells at Kettle's Yard in Cambridge and In the Landscape at New Art Centre & Sculpture Park, Roche Court in Wiltshire. Blackwell, a house full of light and shadows, textures and detail, lends itself particularly well to Murrell's benign observation. The exhibition will show Blackwell in a new, intimate and hopefully unexpected light, inviting the visitor to look with more careful eyes at a house that some will already feel they know well, whilst for others it will be an invitation to discover the ‘secret' life of Blackwell. This solo show of work by leading ceramic artist Philip Eglin will be one of the highlights of 2011. Laden with references to an unpredictable breadth of sources from religion to football, from medieval woodcarving to contemporary packaging, Eglin's work has the power both to provoke emotion and to challenge. He seeks to achieve "...a balance between the high and the lowbrow, the reverent and the irreverent, the raw and the subtle, the sophisticated and the crude". Eglin was born in 1959 and trained at Staffordshire Polytechnic and the Royal College of Art. His work can be found in national and international museum collections including the Victoria & Albert Museum, National Museums of Scotland, Edinburgh and the Stedelijk Museum, Amsterdam. 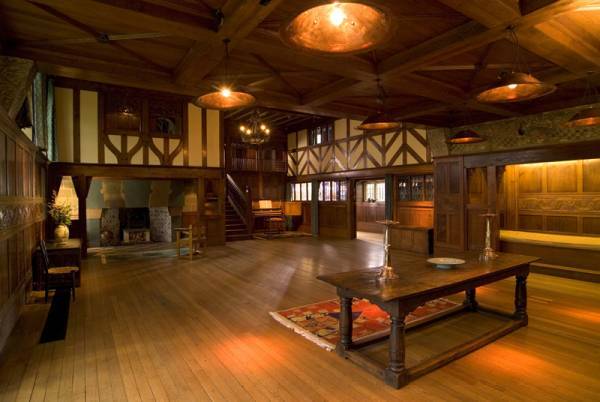 The summer exhibition for Blackwell's anniversary year will look at the work of two outstanding Arts & Crafts architect-designers: Charles Francis Annesley Voysey (1857-1941) and Mackay Hugh Baillie Scott (1865-1945), Blackwell's architect. Voysey was Baillie Scott's senior by nine years and had an enduring influence on him. 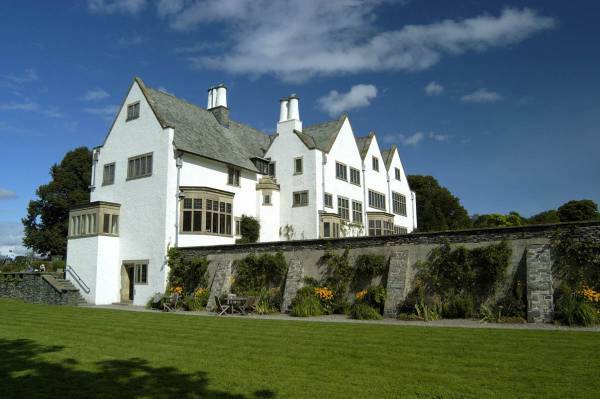 It was the truth and "absolute sincerity" of Voysey's architecture that appealed to Baillie Scott, whilst Voysey in his turn praised the younger man's work. The exhibition will be an opportunity to look beyond the architecture to the interiors and furnishings designed by Voysey and Baillie Scott, and will include textiles, metalwork and furniture as well as architectural plans and archive material.